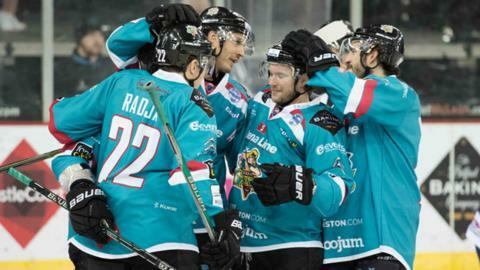 Belfast Giants maintained their strong Elite League title challenge as they beat Coventry 6-3 on Saturday night. Kris Beech and Mike Radja both scored twice with Craig Peacock and Chris Higgins also on target as Belfast earned a sixth win in seven games. Goals from Beech and Peacock put Belfast 2-0 up and while Cale Tanaka replied, Radja and Higgins then netted to leave the Giants 4-1 ahead. Coventry twice cut the lead to two goals but could get no closer. James Jorgensen's goal late in the second period reduced Belfast's lead to 4-2 only for Beech to leave the Giants with a three-goal cushion early in the last period. Russell Cowley cut Belfast's lead to 5-3 with less than five minutes remaining but Radja scored his second goal of the night with just over two minutes left. The sides will meet again, but in Coventry, on Sunday evening when the game will start at 17:15 GMT. With leaders Cardiff losing 3-2 against Dundee after a penalty shootout, the Giants are now five points off the pace in the Elite League although Belfast have three games in hand on the pacesetters. Sheffield remain second in the table - level on points with the Giants - although Belfast also have played a game less than the Steelers.